The Earthshine Visibility Project is an ongoing effort to characterize the ability of the human visual system to detect very small differences in illumination between lit targets in a setting outside the controlled environment of a laboratory. The aim of the Project is to measure the threshold detection contrast of the unaided eye for a variety of observers (different ages, different locations, etc.) to characterize the range of possible values describing the population at large. The result will be a calibration curve that can be applied to other situations where we don’t necessarily know what the detection threshold is. 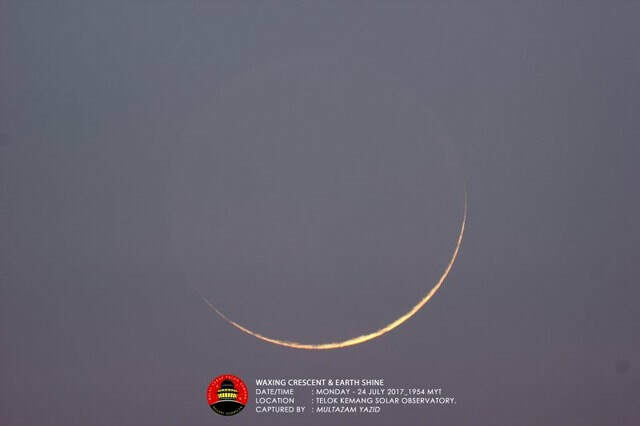 A somewhat comparable observational phenomenon to the Ashen Light is the “Earthshine”, a familiar sight around the time of the new Moon, when the Moon is a crescent. Light from the Sun reflects off the Earth toward the Moon. The light reflects again off the Moon, and heads back toward the Earth. Since some of the reflected light comes from the portion of the Moon’s disk that is not directly illuminated by the Sun, the Earthshine gives the impression of very faint light lighting up the otherwise unseen part of the Moon’s disc. In folklore, Earthshine is sometimes referred to as the “old moon in the new moon’s arms”. Earthshine seen without optical aid, such as binoculars or a telescope, is a good analog for Venus, because the unmagnified Moon is of comparable angular size to Venus. A key unknown about the Ashen Light is its intensity. My collaborators and I are working on computing the intensity of the Ashen Light relative to what we think the threshold of detection by the human eye and brain is. Early indications are that the Ashen Light could be incredibly faint and yet still detectable to the eye through a modest-sized telescope. We’re working on completing that paper for publication now. Earthshine results from a process we know can’t explain the Ashen Light of Venus, but the circumstances are otherwise superficially similar in terms of the observation: a faint light illuminates the part of the Moon not directly illuminated by the Sun. It’s vastly fainter than the bright light seen toward the crescent. It’s easily detectable by the eye alone against a dark sky, but it’s invisible during the daytime because the brightness of the daytime sky overwhelms it. That means there’s a threshold point at which the Earthshine sufficiently exceeds the surface brightness of the (twilight) sky around it that the eye and brain see a positive contrast and detect the light. We’re interested in knowing what that contrast value is, because it tells us something about the sensitivity of the eye and brain system. Surprisingly, there doesn’t seem to be any published research about this. Most vision studies, going back to the 1940’s, use controlled laboratory settings to measure human responses to faint light. Earthshine seen against twilight sky luminances of different values could be a fairly sensitive test of detection contrast threshold useful for predicting detection probabilities for the Ashen Light and other faint light phenomena. At the end of the study, we hope to understand better the sensitivity of the unaided human eye to very small increments of threshold contrast. The sensitivity calibration will be applied to historical accounts of observations of the Ashen Light of Venus in order to help discriminate among several hypotheses that account for its appearance, whether real (i.e., part of the atmosphere of Venus) or false (i.e., a trick of the optics in telescopes). Anyone, with any experience observing the night sky (or none at all) can make useful contributions to this project by looking for the Earthshine under different illumination conditions. You need a clear sky, ideally free of clouds, haze, etc. And you need a clear view of the western horizon (for observations in the evening, when the lunar crescent is waxing) or the eastern horizon (for observations in the morning, when the lunar crescent is waning). By a quarter phase, the Earthshine is difficult to see because it is overwhelmed by the light from the directly illuminated part of the Moon. So the best time to make observations is within plus or minus about six days from the date of new Moon. You can find a list of dates of new Moon for the current year on https://www.timeanddate.com/moon/phases/. You’ll want to be in place looking west (evening) or east (morning) about 10 minutes after sunset (evening) or 20-25 minutes before sunrise (morning). You can get times for local sunrise and sunset from https://www.timeanddate.com/sun/. The task order depends on whether you’re observing in the evening (new Moon plus up to six days) or the morning (new Moon minus up to six days). Scan the western sky to look first for the crescent Moon. This may be difficult within a day or two of new Moon, whereas as you get further away from new Moon, the crescent may be obvious in the daytime sky before the sun sets. Start watching the Moon carefully by about 10 minutes after sunset. At first, all you will see is the crescent with what appears to be blue sky surrounding it on all sides. Then, wait a little longer, until the Earthshine is completely obvious to you and you don’t doubt at all that it is visible. Note this time separately. At that point, if the crescent is small enough, the sky will be sufficiently dark that you should see faint details on the unlit side of the disc. The procedure works in the opposite sense. Be in place by about 25 minutes before sunrise. Locate the crescent Moon, which should already show the Earthshine clearly. Watch over the next several minutes. When you are confident that you can no longer see the Earthshine easily (as the twilight sky gets brighter), write down the local time. Keep watching and judging whether you can see the Earthshine. When you’re certain that you can no longer see any trace of it, write down that time. For evening observations, the two times, at which you think you first might have seen the Earthshine, and when you definitely saw it. Reporting these times in your local time zone is fine. For morning observations, the two times, at which you could no longer see the Earthshine easily, and then when you could no longer detect even a trace of its light. I can use as many observations as you want to make. In fact, it’s useful to have multiple observations, on different nights, from the same observer to get an idea of the range of visual acuity under different conditions. So, you can save observations from multiple nights and report them all to me at once, if you like. Because this study involves human subjects, I will prepare an informed consent form that I will supply you before any data you provide are published. I aggregate the data together by date, noting the observer’s surname. I also look at statistics for individual observers, as well as the group as a whole. Names are only attached to records in my analysis, and will not be disclosed publicly without your permission. I will not associate your name to any specific aspect of the analysis in any public fashion unless I have your permission to do so. All observers will be acknowledged by name in any resulting publications, unless you request that I not use your name, in which case the request will be honored. Any reference to information such as the observer’s age will not be connected to other characteristics that are personally identifiable in any way. Your identity, as associated with specific records of observations, will be known to me but not disclosed publicly as part of the analysis and publication of results.